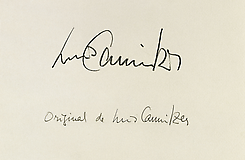 The Luis Camnitzer retrospective, featuring 70 works from the Daros Latinamerica Collection, on view at the Museo de Arte Moderno de Medellín in Medellín, Colombia. The exhibition features works from 1966 – present, detailing Camnitzer's contributions to conceptual art. In collaboration with the Daros Latinamerica Collection, the Museo de Arte Moderno de Medellín provides the Colombian public with a comprehensive look at Camnitzer's body of work. Curated by Katrin Steffen and Hans-Michael Herzog, the exhibition positions Camnitzer as a key figure in art of the second half of the 20th century.